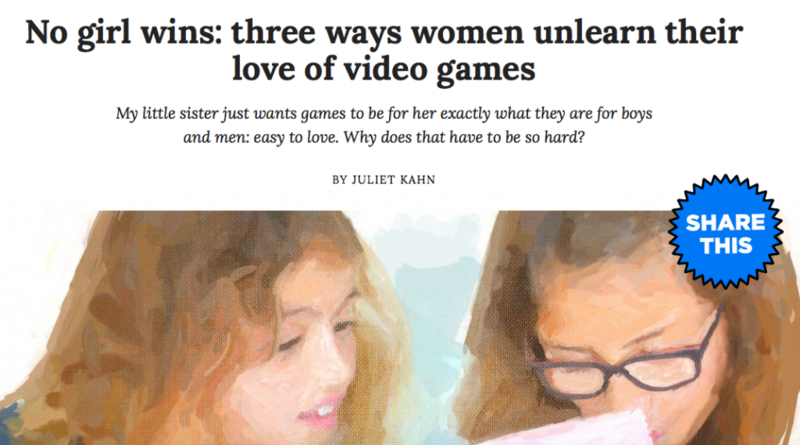 1- the realization from the sister in high school that she did not "grow" out of video games; she had been "gendered" out of them. 2-The second thing reminds me of an experience I recently had at a bike store. I was cycling down a pretty steep hill when the brake cable broke. I remembered a friend mentioning a tiny bike store on my route and decided to see if they could fix it. Now I hate going to bike stores, mainly because my experience talking to the people who work in them has been intimidating verging on downright condescending. But this experience was notable for the fact that it was the total opposite. The repair guy did not make me feel like an idiot for having a beat up old bike with a milk carton perched precariously on the rear rack, or for riding around with broken brakes (ok. Maybe he should have...) He fixed it right away and even walked me through the different expenses. That bike store now has a customer for life.